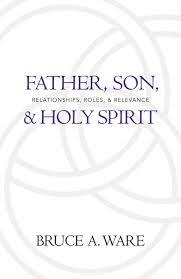 Dr. Bruce Ware, in his book Father, Son, & Holy Spirit: Relationships, Roles and Relevance gives ten reasons to focus on the wonder of the Trinity that I found helpful and insightful. The doctrine of the Trinity is one of the most distinguishing doctrines of the Christian faith and therefore is deserving of our careful study, passionate embrace, and thoughtful application. The doctrine of the Trinity is both central and necessary for the Christian faith to be what it is. Remove the Trinity, and the whole Christian faith disintegrates. Worship of the true and living God consciously acknowledges the relationship and roles of Father, Son, and Holy Spirit. The Christian’s life of prayer must rightly acknowledge the roles of Father, Son, and Spirit as we pray to the Father, through the Son, in the power of the Spirit. The Christian’s growth in Christlikeness or sanctification is rightly understood and enriched when seen as the work of the triune God. The triune relationships of the Father, Son, and the Holy Spirit cause us to marvel at the unity of the triune God. The triune relationships of the Father, Son, and Holy Spirit cause us to marvel at the diversity within the triune God. The triune relationships of the Father, Son, and Holy Spirit cause us to wonder at the social relationality of the triune God. The triune relationships of the Father, Son, and Holy Spirit cause us to marvel at the authority-submission-structure that exists eternally in the three Persons in the Godhead, each of whom is equally and fully God. The doctrine of the Trinity – one God existing in three Persons – provides one of the most important and neglected patterns for how human life and human relationships are to be conducted. As people who are made in the image of God, we live rightly and best when we mirror our relationships after the relationship within the Trinity, which is marked with love and unity. So does the Trinity matter? Yes, regarding our understanding of salvation, sanctification, how we understand our relationships with one another and a host of other issues too! For further reading on the Trinity, here’s an article Dr. Ware wrote concerning the implications the Trinity has on the family. You can read it here.